Definition at line 144 of file CQValidator.h. Definition at line 66 of file CQValidator.cpp. 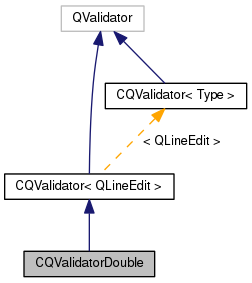 Definition at line 80 of file CQValidator.cpp. Referenced by CQCrossSectionTaskWidget::init(), CQTSSAWidget::init(), and CQTrajectoryWidget::init(). Definition at line 71 of file CQValidator.cpp. 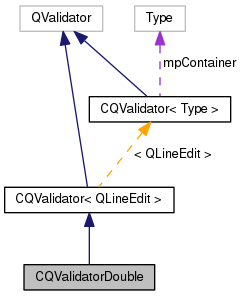 References mpDoubleValidator, and CQValidator< QLineEdit >::setColor(). Definition at line 156 of file CQValidator.h. Referenced by setRange(), and validate().